SatTrackCam Leiden (b)log: SIGINT Galore! The evening of 28 November was very clear - no moon and an extremely transparent sky, with temperatures around zero. I used it to target several objects in GEO and HEO. Due to the favourable sky I could use exposure times twice as long as usual. All the classified objects imaged were Signals Intelligence (SIGINT) satellites, i.e. eavesdropping satellites. 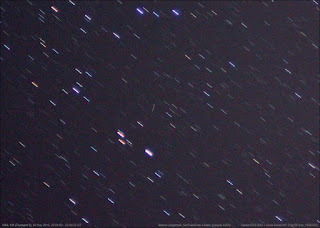 The image above shows you one of the TRUMPET satellites, USA 136 (1997-068A), crossing through Andromeda. 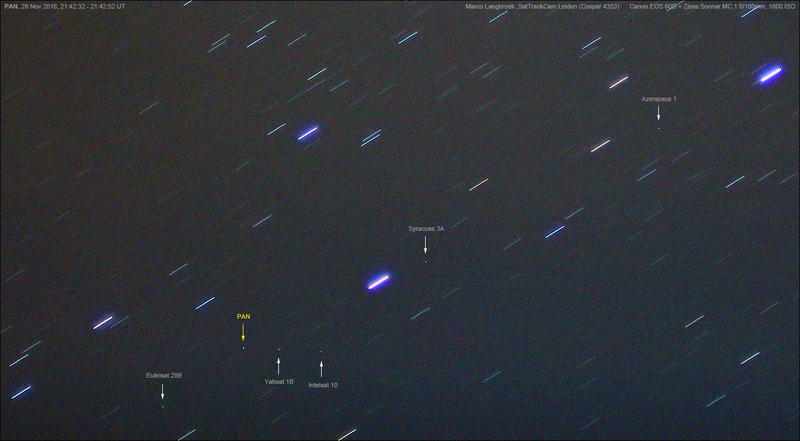 This is an object in a 63 degree inclined HEO orbit. 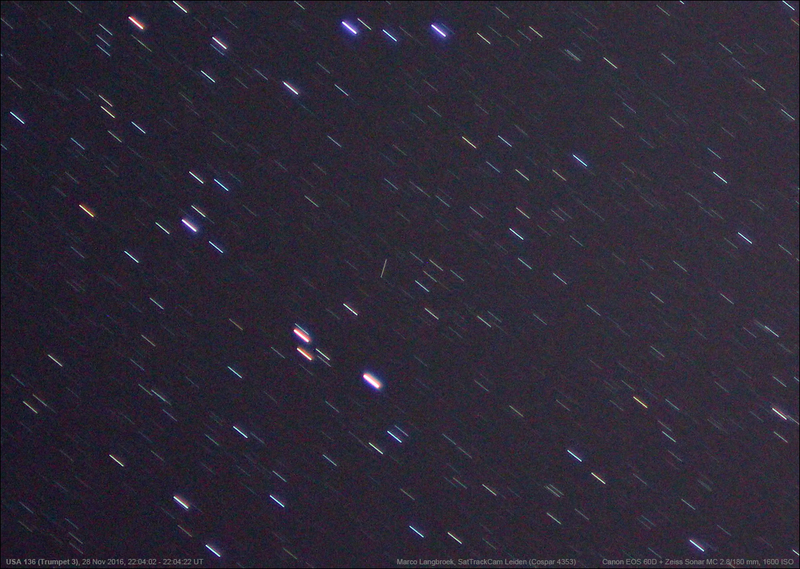 The satellite was coming down from apogee at that moment and at an altitude of ~31 500 km. 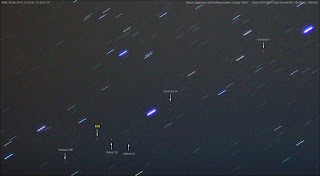 Below is another object in HEO, USA 184 (2006-027A). This too is a SIGINT satellite, part of the TRUMPET-Follow On program (aka Advanced TRUMPET. It also serves as a SBIRS platform. This object was near apogee at this moment, at an altitude of 39 000 km over the Faroër Islands, which is why it looks stellar in this 20-second exposure. 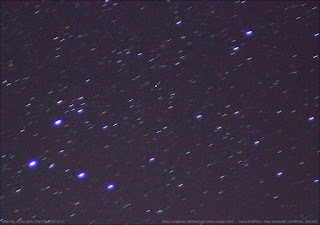 The star field is in Cassiopeia. Both these objects hadn't been observed by our network for a while, hence they were somewhat off their predictions (1.5 degrees in position in the case of USA 136; and 1 degree off position in the case of USA 184). 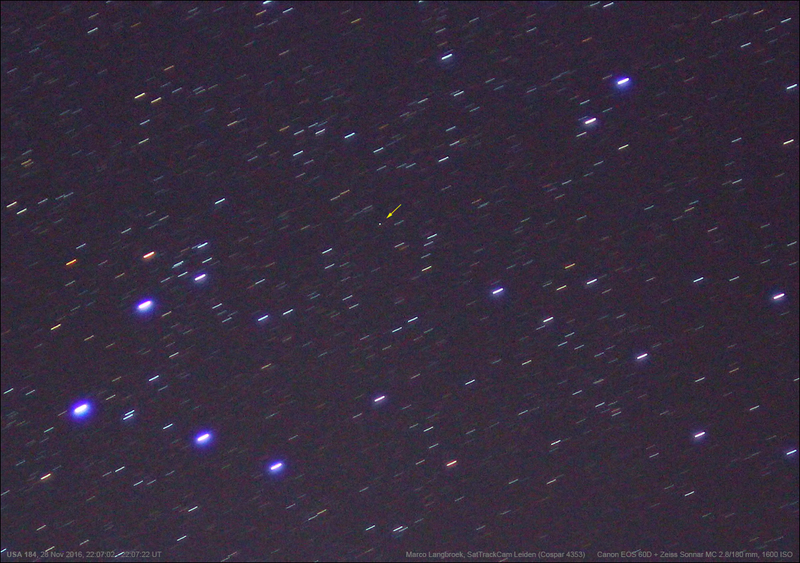 I also briefly imaged a part of the geosynchronous belt, much lower in the sky. 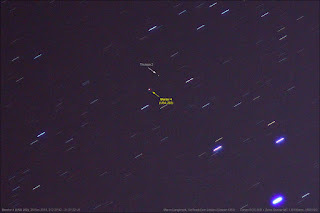 The targetted GEO objects were SIGINT satellites too: both Mercury 1 and Mercury 2 (1994-054A and 1996-026A), The Advanced ORION satellites Mentor 4 and Mentor 6 (2009-001A and 2012-034A) and the NEMESIS satellite PAN (2009-047A). 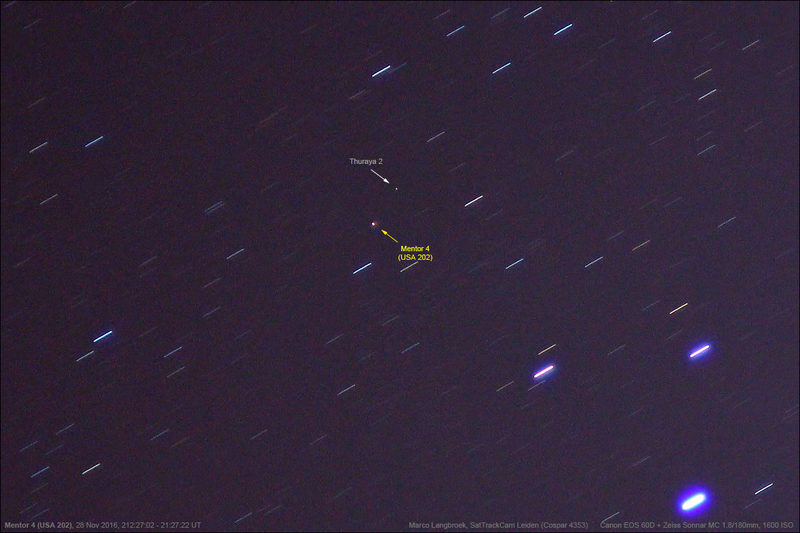 PAN and Mentor 4 (both shown below) have a story attached to them and were the subject of my recent article in The Space Review, which you can read here.